Avery Robitaille’s musical influences differ from her bandmates Kevin Holm and Sean Baker. Baker's dad was a guitar player and influenced him through classic rock icons such as Jimmy Hendrix and Led Zeppelin. Holm generally plays a lot of jazz and has started to learn more classical pieces. As for Avery, she said that she had the following four CDs – no radio – in her household: U2, Evanescence, Casting Crows and Linkin Park. Dear Kora comes from the name of a tribal group in Indonesia that Robitaille holds very close to her heart. She knew that something in her future would be named after the tribe, whether it be a pet or a daughter… or an alternative band. She uses the name as an homage to her homeland and projects that homage by creating music that not only she values but that her bandmates value. 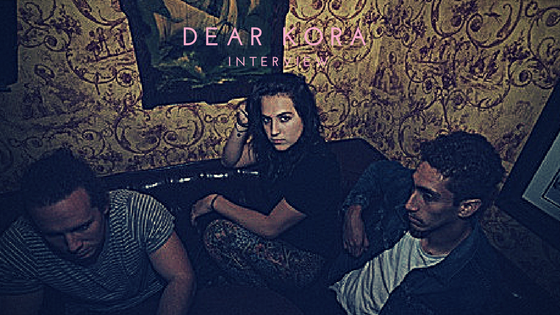 Dear Kora’s debut single, “Sunflower”, was a song Robitaille played acoustically for years before taking the opportunity to rework it with the band’s sound. The song was written right after she moved to America and is meant to be a song of new beginnings. Expanding upon the original song was a long time in the making but was really the push they needed to continue making music and prepare for their first release.